Circular Saucers are for the base of the plant pot to collect excess fluids and protect the roots. Pots are an inexpensive purchase, but nevertheless a very important addition for your kit. Round pots are available in a variety of widths and depths to ensure your plants have enough space to be occupied with wanted nutrient but also enough depth to allow for bigger stronger roots. Some people prefer round pots as they are believed to produce shorter but bushier plants. 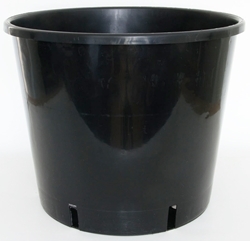 These pots are perfectly suitable to use throughout any growth cycle from start to finish. Round saucers are also available.